There are three quests here that can still be completed after you begin the Final Test. These are the Renegade Students, the Rogue Droid, and the Prisoner's weapon cache, the last of which can only be completed if the Academy is still friendly. All of the quests can still be completed if you've gained enough prestige to take the final test, but have yet to do so. After your introduction into the Academy Yuthura accosts you and basically forces upon you this quest. You are asked to kill Master Uthar during the final test, but you don't have to choose who to side with until the final test. It is in your best interest to report her betrayal to Master Uthar, for which you get 610 XP and +1 Prestige. Go directly to Adrenas (he is located near the exit to the Valley) and pass onto him the datapad to poison Yuthura, which net you 500 XP. Do NOT give the pad to Yuthura, as you won't get these 500 XP. You can report back to Yuthura and tell her what Master Uthar has planned, whereupon she will give you an item to poison Master Uthar. If you wish you can tell her that Master Uthar is planning to poison her to prevent her from being poisoned at the final test, it doesn't really matter either way. In fact you can honestly tell her that you betrayed her, and she won't get very upset. In any case take the poison that she gives you and head over to Master Uthar's room, and plant the device for another 500 XP. You can actually wait until after the final test to use the device on Master Uthar's bed, if you want the XP but don't want to weaken him (he's an easy enough without it). Poisoning one or both of them will not decrease the XP you gain from defeating either one of them at the Final Test. Directly south of where you start in the Academy is Kel Algwin, a Sith with serious doubts about staying here in the Academy. There a couple of ways of dealing with the situation. Firstly you can just kill him outright for some DSP, however this does not give you any prestige or experience (except for the pittance you get for killing him), so there are better ways of dealing with this situation. A second way is to persuade him to tell you his doubts and thoughts of leaving, for which you gain 125 XP. This requires a medium check for dark characters and an easy check for all others. What you do with this information is up to you. For the most prestige tell just tell him off, and then return to Master Uthar and tell him of Kel's doubts for 210 XP, +1 prestige, and some DSP. If you don't want the DSP, tell him to leave for another 125 XP. If you tell him to join the Jedi you'll gain some LSP and another 100 XP, while if you tell him to go anywhere else, you'll only get 50 XP and no LSP. 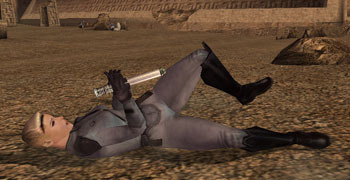 If you do tell him to join the Jedi, you can find him on Dantooine (if it is still available that is) where he will thank you if you talk to him. He's near where Master Zhar was when he was giving you the Jedi tests. If you go to the north side of the East wing of the Academy you will find a Mandalorian prisoner that is being tortured for information, specifically where his weapon's cache is. Note that this side quest will affect your alignment for better or for worse. The Dark way to complete this is to inject him with serum until he cooperates. The first time you inject him you WILL get DSP, as well as when you extract the information from him. You need to inject him with exactly 9 doses of serum, any more and he will become unconscious, any less and he will not cooperate. A Small dose of serum injects 2 doses, the medium 3, and a high dosage injects 5. The small dosage of anti-serum decreases his dosage by 1 and the moderate amount by 2. As you can see from above there are a large number of combinations which reach nine doses exactly, but the easiest is to give three doses of a moderate amount. If you have Dominate mind, you actually have a large leeway, in that he will spill the beans with his dosage at 5, meaning one high dosage is enough for him to talk. In any event if you go this route, when he tells you where his weapon's cache is the torturer will come in and tell you that he is going to take all of the credit. We really can't have that now can we? He is a pushover, so mop the floor with his sorry behind and report to Master Uthar. If you do make him O.D. then you will still gain DSP, and lose any chance of XP or Prestige. The good way is to help free him, but for this you need a decent computer skill. You will need at least 7 ranks in the computer skill. This however is very easy to obtain. With Calrissian's Utility Belt and an interface visor or a pair of Infiltrator Gloves you should already have +7 or more. However before you can do that you need to persuade the prisoner to let you help them by passing a medium persuade check. Once that is done just use the console and use the computer skill to try to put him in a catatonic state. While seven points is barely sufficient, the higher your computer skill the faster and easier you can get it to work, so I suggest that you buff up with Master Valor and use all of the skill enhancing equipment that you have. Please note that each time you use the computer skill and fail, you increase his serum dosage by 1, so that means that you have a maximum of 10 tries before you fail. Remember to use the anti-serum before it gets that high to prevent that from happening. If you wish for a less dark method, you can actually get half the DSP by never injecting serum normally, but by failing the computer use skill check nine times, after which you can ask him. In any case return and report to Master Uthar for 110 XP. If you talk to some of the teachers in the Academy they'll tell you of a group of renegade students that have run away from the Academy and disobeyed orders. Master Uthar has ordered that they be found and killed. You can also get this data by hacking the dueling computer, though it's not really worth the spikes. Anyways the Renegade students are located in the first caves you come across once you enter the valley. Proceed forward and keep to the south, clearing out enemies as you go, and you will eventually run into the students. At this point you can just eliminate them and get a 750 XP bonus if you wish, but this will net you some DSP, as well as any loot that they drop. Thalia drops the Yusanis' Dueling Shield which is only available here. 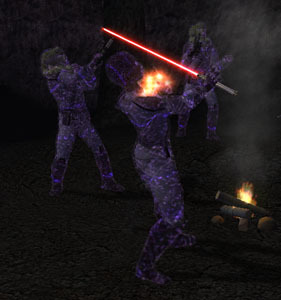 Obviously this easy method isn't for the good Jedi, so the alternative is to make it to the end of the cave system and remove the Terentatek blocking their passage to safety. 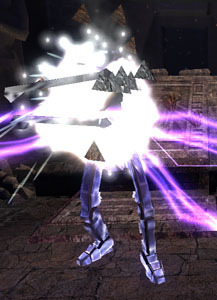 The Terentatek actually has a special ability similar to force push which can be very annoying for melee characters, so you may want to debilitate it as soon as possible. Anyways once you take care of it return to Thalia May and tell her the good news for 1000 XP. She won't listen to you unless you convince her to listen to you. She will automatically believe you if you are light-sided, and requires you pass an easy persuade check otherwise. There are two ways to complete this quest without affecting your alignment. The first and easier way is just to say that you'll leave them be. They'll go hostile after you exit the conversation, and you won't gain any DSP. The other is by failing your persuade check (which is not an easy thing to do) whereupon they will attack you. In any case return to Uthar and report the removal of the students to get 110 XP and +1 prestige. In the Tomb of Marka Ragnos hides a Sith assassin droid that has learnt the value of life. Now you could just blast your way in and take him out (the easy way) or you could try to help him. In either case when you first enter the droids in the first hallway will attack you on sight, so blast away, making sure to loot the corpse that is near the entrance. After clearing the droids out of the first long hallway, save before entering the next room. If you don't plan on helping the droid just enter and send them to an early grave (no extra XP granted). Make sure you DON'T have the sound dampening stealth generator, since conversing with him causes your weapons to be put away. Cognitive Systems must be shut down prior to the Emotional Construct Matrix being shut down. Motor Functions must be shut down early. At least within the first three systems. The Core must be shut down last. Of that I am certain. Sensory and memory functions are shut down in the first half, sensory right before memory. Cognitive Systems are not one of the first half of the systems to be shut down. The Emotional Construct Matrix must be shut down directly prior to the Creative Simulation Matrix, in the last half of the process. I believe the first system to shut down begins with a 'C'. Once you've gotten this far you are presented with a choice to either delete his assassination protocols for some LSP, or to set off his self destruct mechanism for some DSP. Do NOT set off self destruct mechanism as you don't get any extra XP, meaning that fighting him offers more XP and loot, so don't do it unless you really really want those DSP. Once you deactivate his assassination protocols he'll take off and you'll get 1000 XP for your troubles. In any event once you've taken care of the droid, either by saving or destroying him, report to Uthar for another 110 XP and another +1 Prestige. The Sword of Ajunta Pall is located in first tomb on the right hand side of the Valley. To get to the sword enter the tomb and proceed forward, bashing doors and eliminating any Tuk'ata in your way. You'll soon come across a chasm with a bridge blocked by a Therangen Obelisk. A trap kit of any type or an explosive grenade will cause the Obelisk to explode and the Droids to come alive and attack you. Grenades that won't work are the Ion, Cryo and Poison grenades, all others should work. Anyways once the droids attack use destroy droid on them to take them out. If you don't have that force power (nor your companions) you may want to run across and pull the lever, resulting in the droids exploding. Continue forward, bashing the doors and killing any opposition as you go. You'll end up in the final chamber with the Sith sarcophagus. The moment you loot the three swords within, the Spirit of Ajunta Pall appears and if you move, he talks to you. Basically after chatting for a while he demands that you find the correct sword and place it in the statue behind the sarcophagus. If you place the wrong one in it, he will try to kill you (you'll get an extra 500 XP for defeating him this way). While you can choose an incorrect sword on purpose so that you can attack him, it is better if you choose the correct sword first, as you get more XP that way, and you will never get your hands on the real sword otherwise. Place the notched steel sword in the statue and return again to Ajunta Pall. He'll give you the real sword (upgraded) as well as 1000 XP. If you are light sided you can convince him to "return to the light" for some LSP. This however requires that you succeed a high persuade check if you are slightly on the light side, and a medium check if you are very light sided. On the other hand you can have him attack you by provoking him for some DSP. He won't drop any loot, but you'll get some XP. On your way out, you'll run into Shaardan who demands that you hand over the sword. You can pacify him by handing him any one of the three swords. Make sure you do NOT hand over the notched steel sword no matter what, as you get no benefit. If you hand over a fake sword you can watch him get force choked to death at the hands of Master Uthar, the next time you're there. However the best way of dealing with him is to take him out. You won't get any DSP for it, but at least you have the satisfaction of wiping that smug look off of his face. Anyways, now that he's been dealt with return and hand over the sword to Master Uthar for 110 XP if you wish. You can hand over the sword to him whether or not you were able to successfully identify it in the tomb or not. It isn't a particularly good blade, and it can't be sold (unfortunately) so there isn't really a good reason to keep it around. You may have heard various rumors about Uthar's former master, a Hermit in the hills. He can be found hiding in the farthest room of Tulak Hord's Tomb. Proceed forward taking out the various Tuk'ata as you go. Taking the south branch at the T-section will only lead to a dead end with corpse and a large group of Shyrack but nothing important. Continue north and east, taking out a few more Tuk'ata before getting to a large locked door and a computer terminal. Use the terminal to open the door, and upon passing into the next room poisonous gases will come out and knock out your entire group. You and your companions will wake up in the next room with Jorak and an injured Mekel. 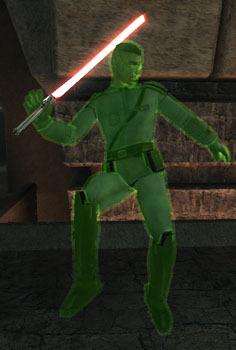 After a chat with Jorak, he will begin testing you on how to be a Sith. If you answer three (any three will do) Mekel will die, and you'll get 1000 XP and Jorak Uln's Tablet. If you kill Mekel within the first four answers you'll also get DSP (probably a bug that you don't get it on the fifth answer). You cannot kill Mekel with the Last question unless you are very dark sided. If you let Mekel live either on purpose or by mistake, once Mekel is let go he uses a force power to free you as well for which you get 1000 XP. Note that you CANNOT die when Jorak is questioning you, as he damages you based on a percentage of your current vitality. Anyways Jorak will then go hostile on you, your companions and Mekel have to take him down. Mekel will then have a few words to say if he survived the battle. If you let him live you'll gain LSP, or you can kill Mekel for some DSP. You can even persuade him to turn his back on the Dark side if you are light-sided for some extra LSP. In any case loot Jorak's corpse for the tablet. Mekel has the rare Phond crystal, which is worth taking, so you might want to let him die. 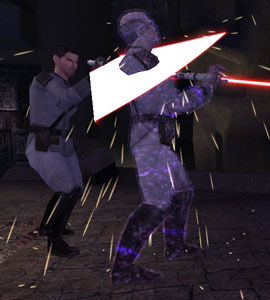 For light-sided Jedi who don't want the DSP for killing him may want to run away from Jorak in the following battle, leaving Mekel alone to face Jorak. I have yet to see Mekel win alone against Jorak, so you can loot both of their corpses and get your hands on that nice Phond Crystal. For those that want to both talk to Mekel to abandon the Dark side, as well as get their hands on the Phond crystal do have one option, utilizing a bug in the script. As soon as you get poisoned, but before you get teleported to Jorak's side, sometimes it is possible to use the coputer console there, breaking the conversation. This means that sometimes you end up next to Jorak, but are able to talk to Mekel before Jorak says anything. You can then convince Mekel to turn back on the Dark Side, get the LSP, then talk to Jorak, and finish the test, letting Mekel live. Mekel will be running away during the entire test, but since the door is locked, he's still stuck in the same room as you. Afterwards you can let Jorak and Mekel battle it out alone, and then loot both their corpses as above. In any case no matter how you deal with Jorak and Mekel, head back to Uthar and give him the tablet if you wish for 110 XP and +1 Prestige. You will find Lashowe in the area east of where you and Yuthura are when you first enter the Academy. If you talk to her she tells you that she has found the location of an artifact that will give her considerable prestige. You can offer to help her and if you pass an easy persuade check she'll hear you out. If possible you'll want to flirt with her, (that requires that your PC is male, and has a charisma of at least 10), as that only requires that you pass another easy persuade check and she'll tell you where to meet without any further requirements. If you are unable to flirt with her, I hope you are in good standing with her, meaning that you didn't insult her when you first met her in Dreshdae. If she hates you you'll have to pass a high persuade check, otherwise a medium check will do. If you pass this check she'll still require that you give her a lead on gaining prestige. You can lie to her about a Sith cloak, but that requires yet another medium persuade check. On the other hand if you have talked to some of the other students and teachers around here you should have a lead or two to give her. Once that is done she'll tell you where to meet and you'll gain 125 XP for having convinced her, (it's just in front of the Tomb of Tulak Hord). Head on over and you'll enter a brief conversation after which three Tuk'ata show up. Take them down any way you can (the Queen can be difficult to take down with force powers), and another conversation will ensue. You'll gain 500 XP for finding the Holocron, but Lashowe will want to take it all by herself to Uthar. Obviously you're going to get screwed if you let that happen. If you insist that the Holocron is yours you'll get some DSP, after which you can take her down and get your grubby little hands on that Holcron for 1000 XP. All other conversation choices are neutral, so even Light-sided Jedi can go get their hands on the holocron so long as you say that you're both going to go to see Uthar. I guess good isn't dumb, after all. Return to Uthar and give him the holocron and honestly tell him that you killed Lashowe for +2 prestige points and 210 XP. If you lie that she's still alive, you'll only get +1 prestige point and 110 XP, so it's in your best interest to be honest here. Strange for the Sith to teach you honesty no? Anyways if, on the other hand, you just let her go, she'll take all the credit (naturally) and you won't gain any XP or even any LSP for doing this, so there isn't any benefit to doing this whatsoever. Return to Uthar and he'll tell you as much. You can challenge her to a duel afterwards for some DSP (she only appears after you talk to Uthar, so you can't do this after you've gotten enough prestige) and if you kill her you can report this for 110 XP and +1 Prestige, but doing it right in the first place nets you a much better reward.